Cornwall did it so well in 2012, it looks like Japan are after a few hints and tips for their Olympic Torch Relay in 2020! The Mayor of a city in Japan visited Cornwall to talk to members of the award winning Cornish team who organised the successful Olympic Torch Relay in the summer of 2012 as part of the Japanese city’s preparations for the 2020 Tokyo Olympics. Hideki Matsuzaki, the Mayor of Urayasu, visited Truro with a group of officers from Urayasu City Council and representatives of the city’s businesses and tourism associations to meet with members of the Partnership set up to organise the Olympic Torch Relay through Cornwall. The Mayor contacted Saltash Cornwall Councillor Hilary Frank after reading a book she had recently published in Japan on local government in which she had referred to the visit of the Olympic Torch Relay to the town. 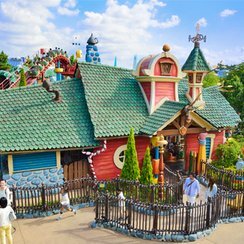 Urayasu is best known as the home of Tokyo Disney Resort - one of the places which will host a leg of the Olympic Torch Relay through Japan. The group of Japanese visitors includes officers from Urayasu's City Council, Chamber of Commerce and Tourism Convention Association. Cornwall's Lead Co-ordinator for the Olympic Torch Relay, Sam Groom, and Chief Executive of Visit Cornwall, Malcolm Bell, will greet Cornwall's guests. The launch of the Olympic Torch Relay at Land’s End on Saturday, 19 May, 2012 at the start of its 8,000 mile journey around the UK was watched by up to a billion people from across the world, with 240 reporters, photographers and film crews from around the world, including Japan, China, Australia, Brazil, France, America, South America, Asia, Russian, Poland, Finland, Hungary and the Netherlands, covering the once in a lifetime event. Around 200,000 cheering people – 35% of the population of Cornwall - lined the streets to watch as the Olympic Flame passed through 21 communities along the route, with around 100 events and activities organised by local groups. Visit Cornwall’s Chief Executive Malcolm Bell said “The 2012 torch relay was the culmination of a tremendous amount of planning and cooperation. We are delighted to meet the delegation and to share not only what we did but what tweaks we would make if we were doing it again“. The Olympics in 2020 will be held in Tokyo, where Japanese Mayor Hideki Matsuzaki hopes to replicate Cornwall's Olympic Torch Relay success!